Phenotypic display of a female Asian Giant Hornet (Vespa mandarinia) resting on vegetation after a quick rainfall. Photo was taken by Yasunori Koide (2009). Image is accredited and licensed under the Creative Commons Attribution-Share Alike 3.0 Unported license. Programmed to Destroy: Tale of the DEADLY Vespa mandarinia. Solice One Bite at a time. Within in the confined subterranean nest of existing burrowers and depressions, lurks a colony of eusocial wasp, with individuals coupled with serrated mandible associated within their peripherals 1, 2. Associated to the posterior of their abdomen, lies a lance-like stinger – which is said to be able to even kill a yak and a human 3. Spanning up to 4.5 cm in length, with a wingspan of 7.5 cm 4, 5, this large Hymenoptera kills without mercy. Anecdotal evidence suggest that a single sting from Vespa feels like a scorching nail dissolving through flesh. 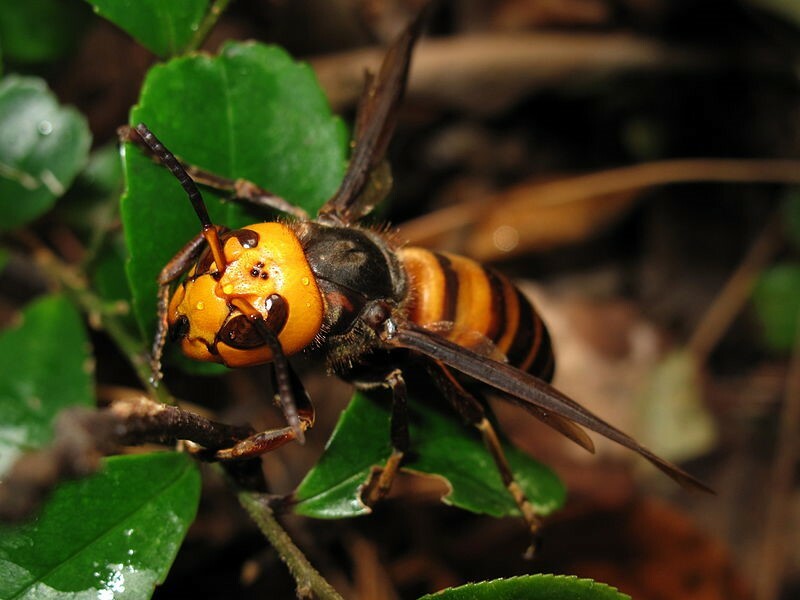 With strong potency in their venom, tridentate mandibles, quick agility and movement 1, 2, 4, a singular Asian Giant Hornet is capable of decimating over 40 honeybees within a minute; multiple Vespa mandarinia are capable of exterminating entire honeybee colonies in less than an hour 6. When the gruesome fray is over, thousands upon thousands of decapitated heads and limbs of honeybees from the genus, Apis remains in the aftermath 6. Coupled with mamastropan and mandaratoxin chemical constituents, potent venom of a singular sting from V. mandarinia is capable of inflicting an array of ailments, including renal failure, anaplasis, and death to any animal 7 – clearly, they do not call this yellow jack a Yack Killer for being benign. Mamastoparan, a cytolytic peptide capable of disrupting fat allow for dissolving of flesh as they sting, while mandaratoxin, a neurotoxin, which inhibits sodium channels within their venom that interferes with the nervous system 7, 8. Scientist suggest that mandartoxin is chemically equivalent to one of the most potent and deadly toxins, tetradotoxin. 1, 9, 10. Even though there are not many deaths that occur by Asian hornets annually, recent outbreaks within northwest China of V. mandarinia has caused mass attacks on citizens: an estimated 1600 were injured with over 40 fatalities within a month during the July of 2013 11. To this date, V. mandarinia has been continually aggressive towards the human sight to the point that scientist are still not confident for what is causing this behavioral stochasticity 11, 12, 13. Anecdotal evidence suggest that Asian Giant Hornets are known to swarm and attack citizens without being perturbed. Since the summer, V. mandarinia has become such a recent pest towards human health that the northwest China’s Shaanxi Province has developed eradication protocols 14. In addition, exchange bounty programs are present, in which nests are traded for currency. Despite relentless efforts to eliminate V. mandarinia, attacks of this yellow jacket has been spreading towards northwest of Afro-Eurasia, with six fatalities in France 15. With growing spatial distribution in Afro-Eurasia, the fate of victims from North America do not look promising; anecdotal evidence suggest V. mandarinia sightings has been spotted throughout areas in the United States. Despite Asian Giant Hornet being famous within the media for fatal attacks throughout the world, they may be an essential nourishment and supplementation option for future food security, in contempt of its notoriety 16, 17. Maybe the best way of controlling this invasive pest is by eat them! Imagine the ultimate revenge against these nasty pests! By consuming Asian Giant Hornets, we are effectively assisting with three main problems: (1) future food security, (2) controlling V. mandarinia population, and (3) nutritional supplementation 17. Asian Giant Hornets (Vespa mandarinia) inspired hors d’oeuvre using fresh Asian cucumbers, marinated Chinese horseradish, and sautéed Asian Giant Hornets. Photo was taken by Charlotte Payne (2014). Image is accredited and licensed under the modified Creative Commons Attribution-Share Alike 3.0 Unported license, with permission from Charlotte Payne. It is estimated that over two billion people regularly and intentionally consumes insects within their diet, while almost seven billion consumes trace fragments daily 18. Despite, Giant Hornets being aggressive in nature, they are harmless, safe, and edible for human consumption, despite the potent venom. The stinger and venom sac are removed during food preparation 19. Preparation of V. mandarinia is very similar to cultural entomophagy of Hymenoptera, including a variety of bees and wasp 16. From Japan, Asian Giant Hornet cultures collect workers within the hive complex by attracting them with bait, commonly in the form of a meatball. The entrance of the nest is then dislodged and fumigated with a gas sedative within the nest 17. Some less invasive protocols include tying white string around the abdomen of individuals as they consume the bait or collection during diel unalignment, during the night when most are torporing 17. Asian Giant Hornets can be prepared ubiquitously in many ways, from soul food to exquisite delicacies. In Japan and many parts of Asia, boiling or frying pupae/larvae with soy sauce or salt are the most common methods in cultural entomophagy of V. mandarinia 17, 20. With a growing popularity in cultural entomophagy, the experimentation of Asian Giant Hornet cuisines continue to evolve over time 21. Anecdotal evidence from many entomologist bloggers and chefs have known to add Asian Giant Hornets to pizzas, soups, stir-frys, and deserts; clearly, the number of arrangements are not limited! Despite indescribable taste of Asian Giant Hornets from many traveling western entomophagists, some suggest that is has a tough texture and savory taste. In most Asian cultures, this known as umami 22. So, with the rise of invasive Asian Giant Hornet pest spreading globally, what is the best way of controlling these unpleasant species? Maybe the most sustainable and practice way is to eat them! Take your rage and become one with the Asian Giant Hornet. If you cannot live with it, you eat it! To learn more about the harvesting process of Vespa mandarinia, click here. Bugs in my soup! Try the popular pufferfish roe Asian Giant Hornet shabu-shabu! Anyone up for Vespa shasimi? Want to check out an Asian Giant Hornet hors d’oeuvre or pizza from Charlotte Payne? 1 Archer, M. E. (1995). Taxonomy, distribution and nesting biology of the Vespa mandarina group (Hym., Vespinae). Entomologist’s Monthly Magazine (United Kingdom), 29(131): 1568 – 1571. 2 Matsuura, M., & Sakagami, S. F. (1973). A Bionomic Sketch of the Giant Hornet, Vespa mandarinia, a Serious Pest for Japanese Apiculture (With 12 Text-figures and 5 Tables). Department of Science, Hokkaido University Journal of the faculty of Science Hokkaido University Series V I: Zoology, 19(1): 125 – 162. 3 Nguyen, L. T., Saito, F., Kojima, J. I., & Carpenter, J. M. (2006). Vespidae of Viet Nam (Insecta: Hymenoptera) 2. Taxonomic notes on Vespinae. Zoological science, 23(1): 95-104. 4 Kumar, P. G., & Srinivasan, G. (2010). Taxonomic studies of hornet wasps (Hymenoptera: Vespidae) Vespa Linnaeus of India. Records of the Zoological Survey of India, 110(2): 57 – 80. 5 Kojima, J., Saito, F., & Nguyen, L. T. P. (2011). On the species-group taxa of Taiwanese social wasps (Hymenoptera: Vespidae) described and/or treated by J. Sonan. Zootaxa, 2920(1): 42 – 64. 6 Smith, F. (1852). VIII. Descriptions of some new and apparently undescribed species of hymenopterous insects from North China collected by Robert Fortune, Esq. Ecological Entomology, 7(2): 33 – 44. 7 Abe, T., Hariya, Y., Kawai, N., & Miwa, A. (1989). Comparative study of amino acid composition in an extract from hornet venom sacs: high content of neuroactive amino acids in Vespa. Toxicon, 27(6): 683 – 688. 8 Higashijima, T., Wakamatsu, K., Takemitsu, M., Fujino, M., Nakajima, T., & Miyazawa, T. (1983). Conformational change of mastoparan from wasp venom on binding with phospholipid membrane. FEBS letters, 152(2): 227 – 230. 9 Gilchrist, J., Olivera, B. M., & Bosmans, F. (2014). Animal toxins influence voltage-gated sodium channel function. In Voltage Gated Sodium Channels. Springer Berlin Heidelberg 171(221), 203 – 229. 10 Zlotkin, E. (1997). The role of hymenopterous venoms in nature. Bee Products, 1(1): 185 – 201. 11 Handwerk, B. (2013). World’s Biggest Hornet: Insect behind deadly attacks. National Geographic News. Retrieved from http://news.nationalgeographic.com/news/2013/10/131004-giant-hornet-insects-attacks-china-animals-science/. 12 Ono, M., Terabe, H., Hori, H., & Sasaki, M. (2003). Insect signaling: components of giant hornet alarm pheromone. Nature, 424(6949): 637 – 638. 13 Taylor, B. J., & Jeanne, R. L. (2009). Individual and social foraging in social wasps. Food Exploitation by Social Insects: Ecological, Behavioral, and Theoretical Approaches. CRC Press, 1(1): 53 -79. 14 Guilford, G. (2013). The best way to kill China’s deadly giant hornets: meet the “divine gun” and “hornet pouch”. Quartz Media. Retrieved from https://qz.com/on/chinas-transition//. 15 Nelson, S. N. (2014). Deadly Asian Hornets Have Killed 6 In France & Could Be On Their Way To Britain. The Huffington Post (United Kingdom). Retrieved from http://www.huffington post.co.uk/2014/04/16/asian-hornets-killed-6-france-britain_n_5158733.html. 16 Mitsuhashi, J. (2004). Entomophagy: human consumption of insects. In Encyclopedia of Entomology. Springer Netherlands, 1(1): 786 – 787. 17 Gahukar, R. T. (2011). Entomophagy and human food security. International Journal of Tropical Insect Science, 31(03), 129 – 144. 18 Nadeau, L., Nadeau, I., Franklin, F., & Dunkel, F. (2015). The potential for entomophagy to address undernutrition. Ecology of Food and Nutrition, 54(3): 200 – 208. 19 de Lima Bicho, C., & Müller, G. A. (2017). Other Irritating Arthropods (Beetles, Bugs, Centipedes, Etc.). Arthropod Borne Diseases. Springer International Publishing, 1(4): 549 – 566. 20 Pal, P., & Roy, S. (2014). Edible insects: future of human food–a review. International Letters of Natural Sciences, 1(1): 1 – 21. 21 Durst, P. B., Johnson, D. V., Leslie, R. N., & Shono, K. (2010). Forest insects as food: humans bite back. RAP publication. 1(1): 1 – 241. 22 Meyer-Rochow, V. B. (2010). 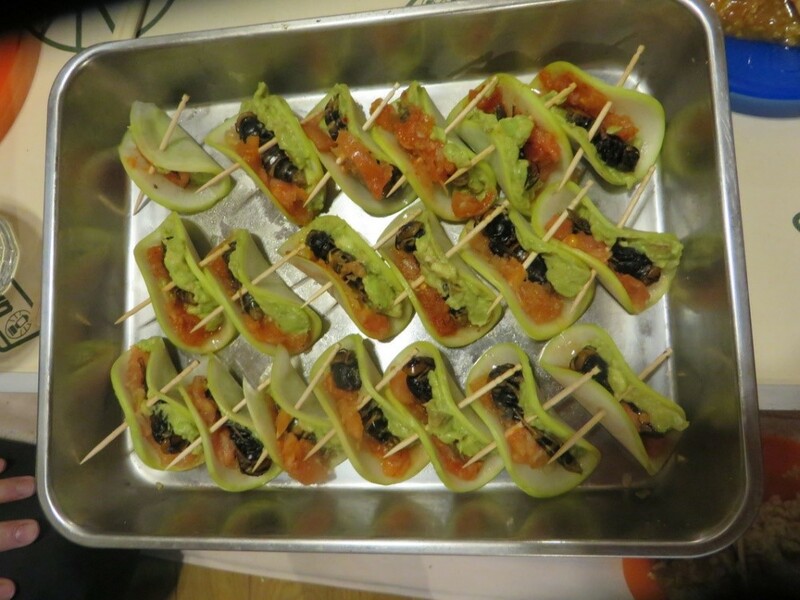 Entomophagy and its impact on world cultures: the need for a multidisciplinary approach. Edible Forest Insects, 6(2): 23-36. This work by Michael X. Yue is licensed under a Creative Commons CC-BY Attribution 4.0 International License.